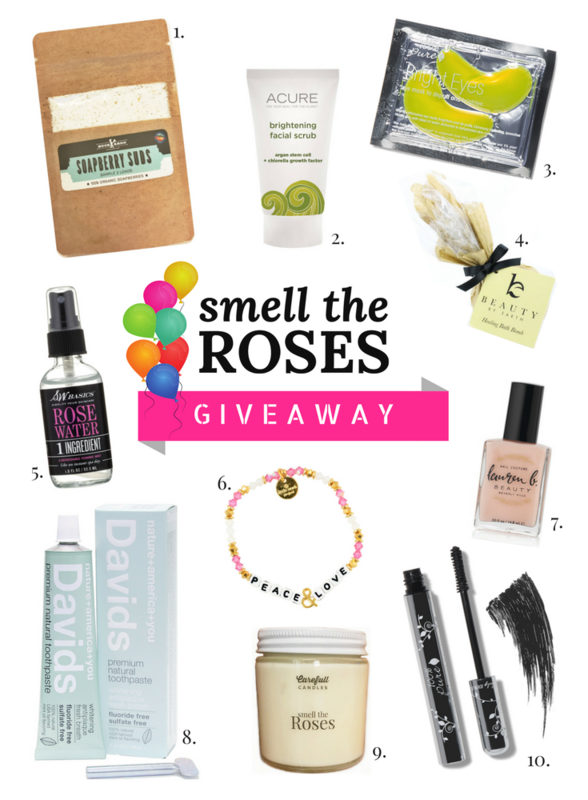 Smell the Roses Turns 1: Birthday Giveaway! 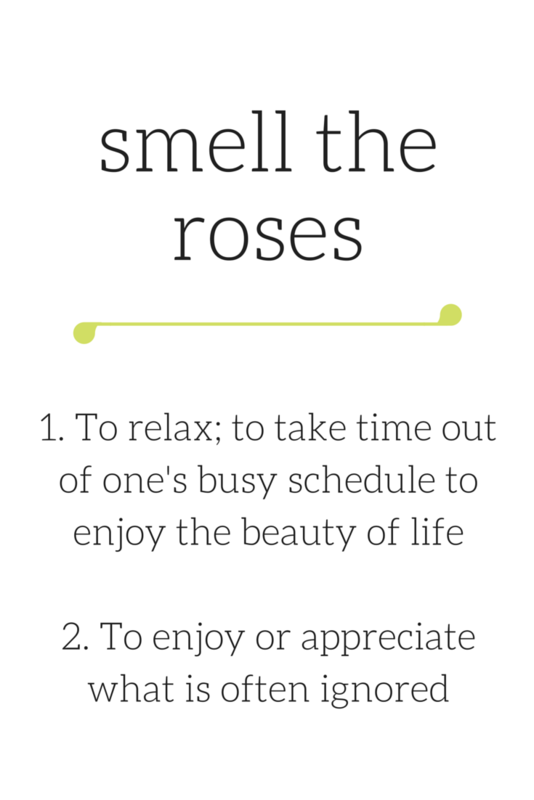 Smell the Roses is officially 1 year old and to celebrate I am offering an AWESOME birthday giveaway valued at over $115! These 10 products are some of my all-time favorite cruelty-free products that I have been using ever since I made the switch to a cruelty-free lifestyle. This giveaway is my attempt at thanking all of you for your support over this past year. I am so grateful for each and every one of you! *This post contains affiliate links in which I earn a small commission. I have not been paid or compensated to feature any of these brands in this giveaway. All opinions are my own! THIS GIVEAWAY IS OFFICIALLY CLOSED. Complete at least one entry option in the Gleam plugin provided on this page. Remember, the more entry options you complete, the better your odds of winning but additional entries are not required. Certain entry options are weighted more heavily than others. Open to the U.S. and Canada to anyone 18 or older with a valid mailing address. You may enter the giveaway anytime between August 16th and August 31st 11:59 pm EST. The winner will be randomly generated using the Gleam Plugin and announced September 1st at approximately 12:00 pm EST on this blog post, Instagram, Facebook, and Twitter. All entries requiring following/liking will be checked and verified before the winner is drawn – any missing likes/comments will not be credited as an entry. I run giveaways for my readers who are genuinely interested in the products I am offering. Entries completed with social media accounts used solely for giveaways will not be counted. Although the giveaway winner is randomly generated, if you are chosen as the winner and I see you did not follow this rule, I will manually invalidate your entry and have a new winner randomly generated. Once a winner is selected, I will personally contact him/her with the email address he/she used to enter the giveaway in order to obtain his/her shipping address. If no response is made within 48 hours, a new winner will be chosen. I have not been paid to feature any of these brands although this post does contain affiliate links through which I earn a small commission. This year I finally switched over my household items to cruelty-free/natural alternatives. In place of my Tide Pods, I started using Soapberry based laundry detergents. 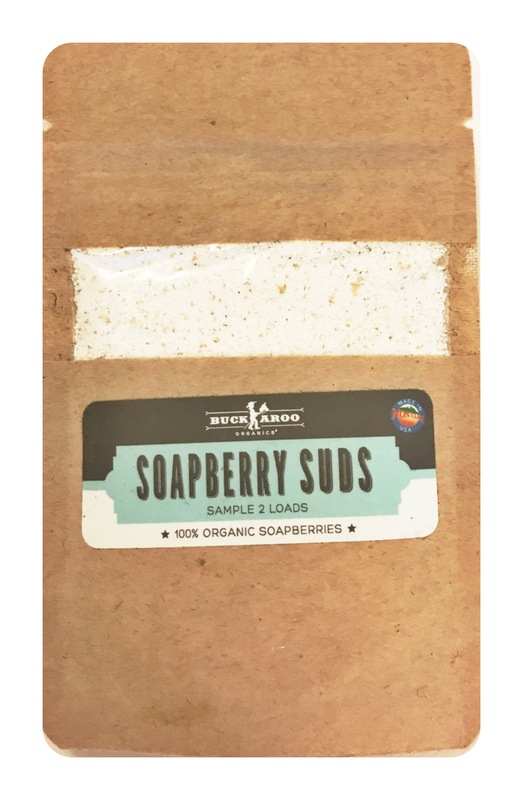 Included in this giveaway is a sample size of Buckaroo Organics’s Soapberry Suds. This is a powder form of detergent made with only 4 ingredients, one being 100% Certified Organic Soapberries. The soapberry not only cleans your fabrics but also naturally softens them. I still can’t believe how well this detergent works! It feels good knowing I’ve eliminated countless chemicals from my home and the environment. This is the best natural facial scrub I have come across. I use it bi-weekly to gently exfoliate my face without drying out my skin. After using, I am left with a more even skin tone and baby soft skin. Best part? It’s 100% cruelty-free and vegan. 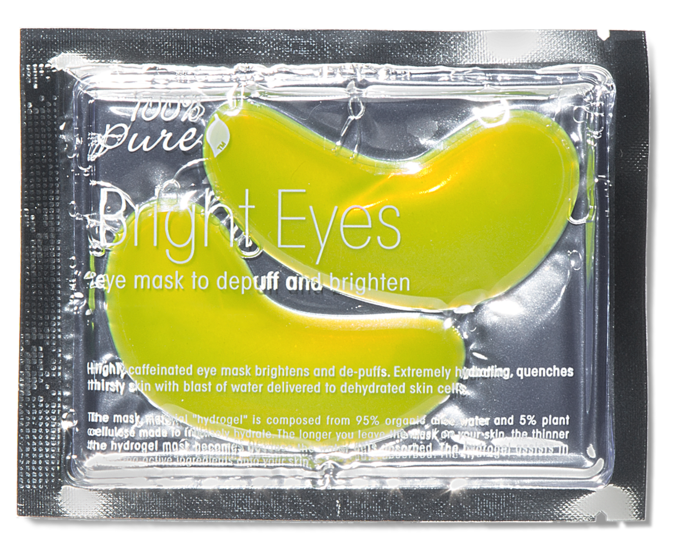 I am in love with these little eye masks from 100% Pure! I put them under my eyes in the morning after washing my face and leave them on for as long as possible. They are infused with caffeine to depuff and brighten your under-eye area while also providing intense hydration from organic aloe water. These are a great addition to your morning routine and truly make a HUGE difference! Since they are a little on the pricey side, I only use them on the mornings when I really need to depuff my under-eyes (i.e. after a late night working in the ER or after watching the Notebook 😂). 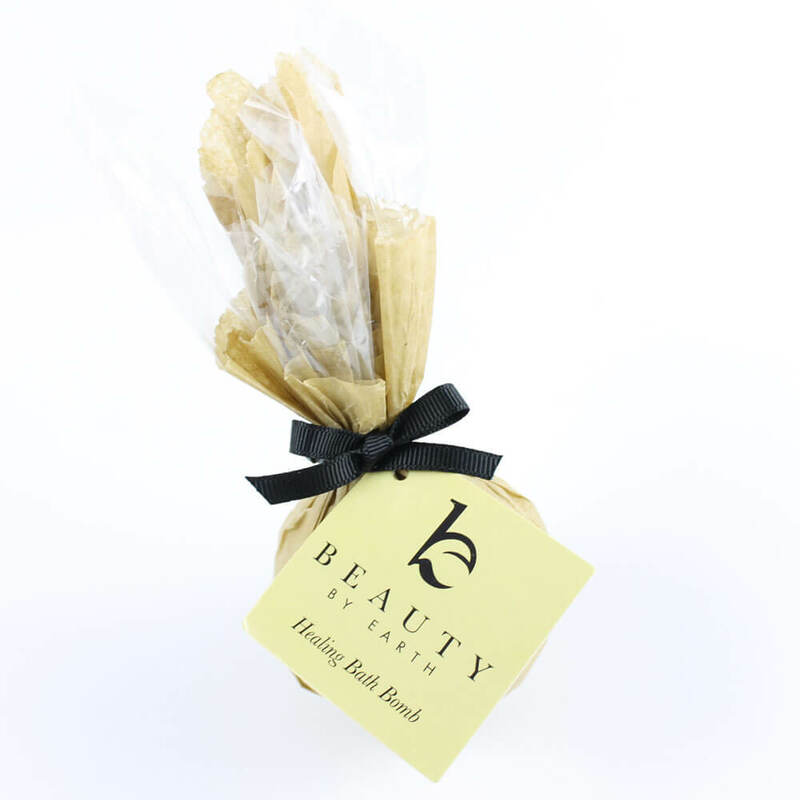 If you read my bubble bath post, you may remember these bath bombs from Beauty by Earth. Unlike other popular bath bombs, these are 100% natural and made without Sodium Lauryl Sulfate (a chemical used for foaming), artificial dyes, colorants, or synthetic fragrance (all found in the Lush Bath Bombs 😕). Each of their bath bombs are designed to fulfill a different need. This giveaway features their “Muscle Relief” Bath Bomb! If you can’t already tell from the name of my blog, I love roses. Not only are they beautiful to look at, but they have become a staple in many people’s beauty routines. This Rose Water from S.W. Basics is made from pure, steam-distilled rose water with no other additives or ingredients. I spray it all over my face and neck after washing to serve as a toner and gentle moisturizer. It is also great to spray on before applying makeup, as a setting spray for your makeup, or to simply keep in your purse to freshen up when on the go. This is the prettiest light pink nail polish I have ever come across so I knew I had to include it in this giveaway. 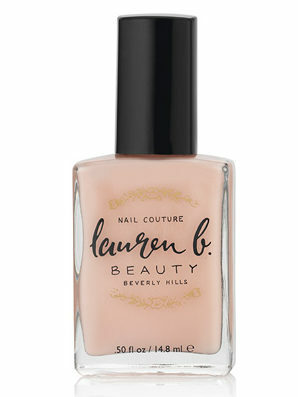 This color is just one of Lauren B Beauty‘s gorgeous colors from their new Bridal Collection. All of their polishes are cruelty-free and made without 7 of the most dangerous chemicals still lingering in most popular nail polish brands (i.e. Toulene, Formaldehyde, Dibutyl Palate (DBP), Formaldehyde Resin, Camphor, TPHP, & Xylene… yuck). I have an entire post on this brand coming soon so keep an eye out! I have been using this toothpaste for over a year and it is definitely my favorite! I love it because it naturally whitens and removes plaque without destroying your enamel. Its formula is of fluoride-free, sulfate-free, and made without artificial flavors, colors, sweeteners, & preservatives. Plus, it’s cruelty-free and American made! You may remember this brand from my Fall Scented Candle Giveaway last October. Until last year, I never put much thought into what my favorite candles from stores like Yankee Candle and Bath & Body Works had in them. Unfortunately, when burned these candles release toxic fumes into the air which are harmful when inhaled. 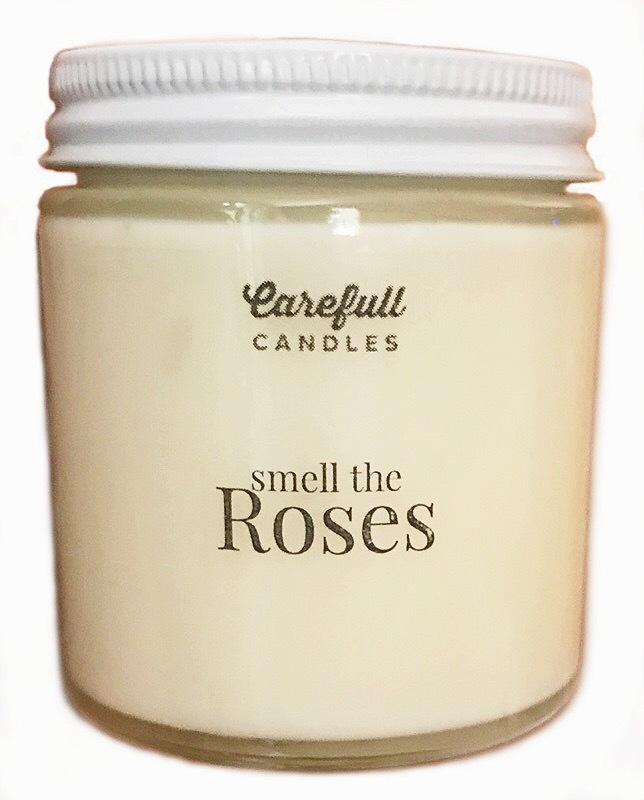 Luckily, brands like Carefull Candles make amazing smelling candles using 100% Soy Wax and essential oils. This candle was inspired by this very blog so I had to include it in this giveaway! This was one of the first cruelty-free, non-toxic mascaras I ever tried and it has since been a favorite of mine. The pigment comes from actual black tea rather than harmful chemical-filled dyes so it’s perfect for anyone with skin/eye sensitivities. Its natural ingredients actually condition your lashes instead of drying them out and making them susceptible to breakage. 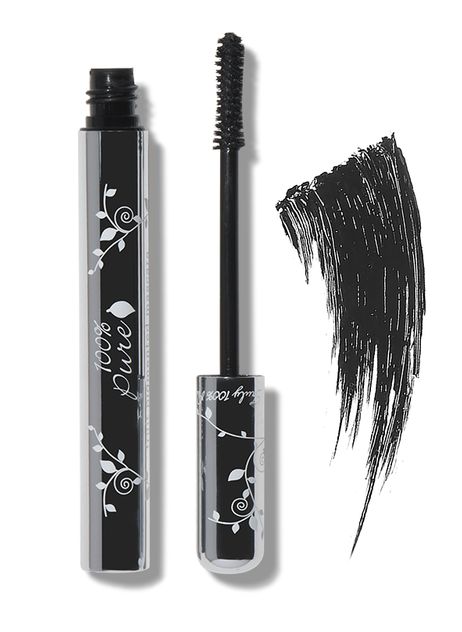 As with all of 100% Pure‘s products, this mascara is 100% natural and cruelty-free! I hope you are as excited about this giveaway as I am! Let me know what your favorite product is in the comments section below. I’d also love to hear which of my blog posts over the last year was your favorite or what kind of posts you’d like to see this year. As always, if you have any questions you can email me through my contact page. This giveaway ends August 31st at 11:59 pm! Good Luck! My favorite blog post from Smell the Roses this year was Staying Safe in the Sun: Nontoxic Sunscreen & Sunbathing Tips. I’m excited to win the S.W. 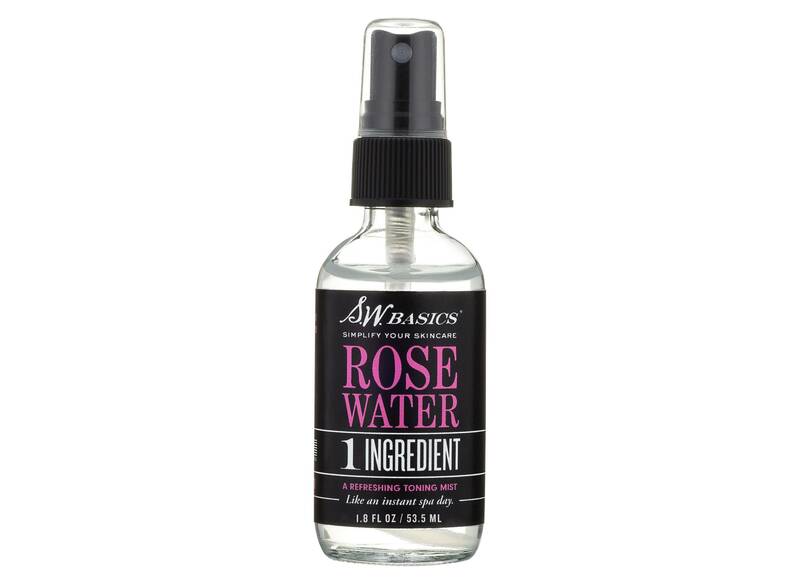 Basics Rosewater Spray because I have sensitive skin. Thanks for the chance! My favorite post was the one you just did on what you learned your first year blogging. I love your honesty and advice. Congrats on your 1st year! Oh and the product I am most excited to try is the candle!! Sounds like it would smell amazing! Happy blog birthday! Thanks for the awesome giveaway! My favourite posts have been product reviews – especially the Beauty by Earth ones! I hope one day their shipping to Canada will be lower. Also your proposal story post is beautiful! No surprise I’d be most excited to try the Beauty by Earth product 🙂 And happy 1st birthday to the blog! The big makeup vs no makeup debate and facial scrub product! I am really excited to try this mascara! I really enjoyed your soapbox review. I’m really excited about the muscle relief bath bomb. I could definitely use that. Congratulations on 1 year and I hope for many more! !Thanks for the chance! Most excited for the nail polish! The color looks really cute. Your proposal story was a very nice blog post. 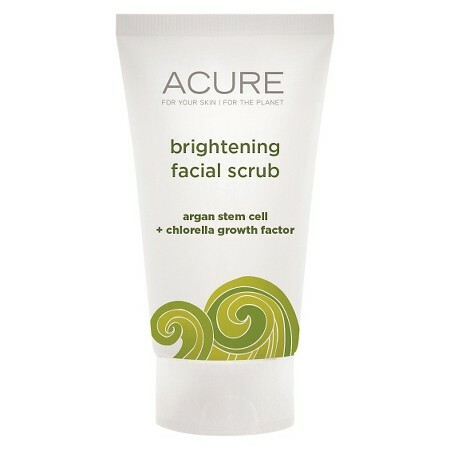 I think my fav thing on this post is the Acure Organics Brightening Facial Scrub! Happy one year Blogaversary!! You have some great content and I love your reviews! I enjoy all the reviews on products. I really liked your post on staying safe in the sun! I’d love to win this and I think I’d be most excited about the facial scrub or toothpaste! Congratulations on your one hear anniversary. Here’s wishing you lots of success. How inspiring! I just started working on my own small blog. It’s great to see someone who is making it. Congratulations on your anniversary! These products all look awesome. I’d love to feature them- and Smell the Roses- on my Instagram! Happy BIrthday! Let’s celebrate… woohoo! Very Happy Birthday wishes! Super excited for you! The blog on Carry On Essentials- Flight Survival was so helpful to me as I’m a frequent flyer. I am most looking forward to trying Acure Organics Faccial Scrub and also David’s Toothpaste. Thanks so much for the wonderful giveaway and chance to win! Congratulations on 1 year and I hope for many more years of great success. Congratulations on your 1 year! I really enjoyed reading the Big Makeup no Makeup Debate blog post. 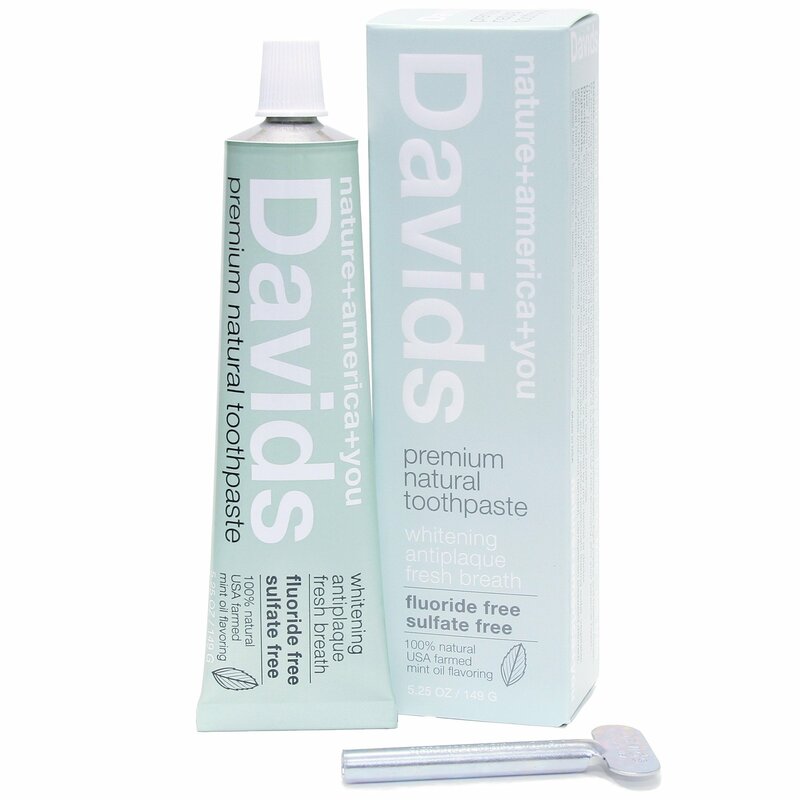 I’m most excited to win the 100% Pure Bright Eye Mask or the David’s Natural Toothpaste. Thank you for the chance. All of these items look amazing. i am especially excited to try the bright eyes mask. I enjoyed the blog post on staying safe in the sun. And the ingredients to avoid/look for in sunscreen. I am in California, and in the sun frequently. This was eye opening and informative. Thank you. I’m new, so I’m reading the blog now! It’s my favorite type and I’m glad to be following! I’m loving the rose candle. I’m obsessed with candles and this one looks and sounds beautiful. I only burn naturals! The detergent is a new one for me too, so it would be great to try. Thank you for such a wonderful giveaway! My favorite blog post was the “Staying Safe in the Sun: Nontoxic Sunscreen & Sunbathing Tips”. I am really excited about the Rosewater and the nail polish, but everything is just great! Congrats on the birthday!!! I’m excited about this opportunity!! Most excited to win the candle, toothpaste and mask!! This is soo awesome thanks so much 🌱🌿💚 green beauty! Happy Birthday! Thank you for this amazing chance at this giveaway! Congratulations on your one year mark! Looks like a wonderful product giveaway!! I like all your organic product reviews and giveaways. Such a cool birthday giveaway! I liked the stay safe in the sun and I could really use the scrub! I have enjoyed all of your posts this year. I would be most excited to try the mascara. Congratulations on your first year. I can’t wait to see what’s in store.